Editor’s Note: This post was written by Ohio University junior Luke Kubacki. Luke is the Campaigns Coordinator for STAND, the student-led movement to end mass atrocities, and was also a participant in the Lemkin Summit in February 2015. In the day-to-day of campus life, it’s so easy to lose sight of the something greater. This is especially hard for me as I go to school in a small town where the university is really the only thing around. My time is divided between class, Donkey Coffee on Washington Street, and the Smiling Skull bar on Union. Of course, as a student, my mind is divided as many ways as it can be between class, reading, papers, projects, summer, food, bills, work, money (money, money). From the students that I’ve talked to, this is a very familiar slump that most of us experience. Even if we love what we study and enjoy the work we do, it’s so hard to maintain this double vision, a balance between the work that’s necessary now and the work that’s necessary for the something greater. Last month, the Lemkin Summit pulled 110 of us out of this slump and gave us an opportunity to focus on this greater something: the movement to end genocide and mass atrocities. As I drove away from Athens towards DC with four other student activists from around Ohio and Michigan, I felt the excitement of this shared vision. Over the next three days, we explored this vision through educational sessions and trainings, then presented it to the elected representatives in Washington. I was profoundly inspired and motivated by two things. The first was the work being done by active students across the country. The opportunities to connect with fellow students were full of conversations about the failures and successes of different campaigns on campus. We exchanged strategies and discussed the different trainings in which we were participating. But, more importantly, we were able to connect on a personal level. We talked about the difficulties of balancing the demands of the everyday and the pull of the vision we shared. We talked about the disappointment we feel after no one participates in a campaign or when 9 people populate a room for 200. I saw the struggle that I experienced so often was shared across the country. I felt the movement. The second thing that profoundly inspired me was the work being done by professionals in DC. A small group of us met with Special Envoy Russ Feingold who has served as the U.S. Special Envoy to the Great Lakes Region of Africa (which consists of Uganda, DRC, Burundi,Tanzania, Kenya, and Rwanda) and the Democratic Republic of Congo for the past two years. Special Envoy Feingold, who announced the week before that he would be stepping down from his position, sat with us and shared candidly the diplomatic difficulties, failures, and successes of the past two years. I saw the common vision we had shared over the weekend in a State Department office. I heard it in Feingold’s voice as he told us that the genocide and mass atrocity prevention successes over the past 15 years would not have been possible without the student voice and without the student body filling public spaces to advocate for the voiceless. I felt the movement. I remember writing letters, making phone calls, tabling outside of the student union, and posting all over everybody’s social media for the creation of Russ Feingold’s position my freshman year. To see that come in a full circle and hear him talk about the peace we moved towards was eye opening. The slump from which we all operate felt a bit more meaningful and the maintenance of that shared vision felt a bit more possible. Over one hundred of us left DC ready to use our new tools and share the vision. We felt the movement. 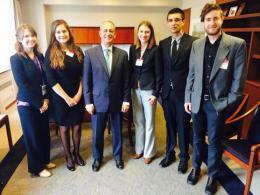 Photo: Luke Kubacki (far right) joins a group of Lemkin Summit participants and Enough Project staff in a a meeting with Special Envoy Russ Feingold. Over the past year, the ongoing civil war in South Sudan has only worsened conditions for civilians. In the face of months of ethnic violence, South Sudan is in the midst of a major humanitarian crisis. Not only have over 1 million people been displaced, but 3.8 million are in need of humanitarian assistance. The largely man-made crisis is about to get much worse. Already teetering on the edge of famine, South Sudan’s government has expelled foreign workers. Once in effect, the decree will prevent NGOs from offering critical assistance to people who need it the most. It’s time to come together in solidarity with these civilians and raise awareness about South Sudan’s crisis. On September 29, students across the world are participating in STAND’s “media fast” (STANDFast) from their electronic devices to raise awareness about the current crisis in South Sudan. In giving up social media for a day, we remember the thousands in South Sudan who have had so much more taken from them. As you fast from social media, STAND asks that you leave an “away message” on your e-mail, facebook, twitter, etc. provided here to raise awareness for the cause. During STANDFast 2014, students can also make donations to UNHCR’s efforts in South Sudan to support humanitarian relief efforts for displaced and at-risk South Sudanese. Stay tuned for more information to get involved! We’ll be sending an email with more information. You can also check out the STAND website for South Sudan for unfolding developments in the campaign. The United Nations, similar to the United States Congress, has time when the body is “in session” and times when the body is in “recess.” Over the latter half of the summer, the UN General Assembly (UNGA) has been in recess. The UN delegates from all over the world are reconvening in New York City on September 16th and the UN General Debate opens the following week on the 24th. Many organizations are organizing around these couple weeks to make sure that their issue is made a priority in the global conversation. As Sam’s informational summary explains, the conflict in Syria is grave. Nearly 200,000 people have been killed by the violence in Syria. More than 6 million are internally displaced and more than 3 million registered refugees have spilled into surrounding countries, according to the UN High Commission on Refugees. Chemical weapons have been used along with indiscriminate bombings and acts of terrorism. Even more alarming is that the conflict has descended into a state of complexity that discourages headlines and has forced the conflict into a state of invisibility on the international stage. People have stopped talking about it. We have stopped trying to understand it. Let’s fight this. Let’s make Syria a priority in the global conversation. Surrounding UNGA week, STAND will be providing chapters and engaged student actors with educational resources about Syria. We will be asking you to organize events around the theme of engaging with the complexity of the conflict in Syria. Instead of shying away from the complexity, let’s engage with it, study it, find ways that we can enter in and influence. Most importantly, LET’S GET PEOPLE TO TALK ABOUT SYRIA AGAIN. We are starting off with a website. On this website, you will find information about the conflict in Syria to educate yourself and resources to help you educate others. We begin with a simple overview drawn up by Sam, our Education Coordinator. We will build this website into an educational resource that delves into the history of the conflict, various actors involved, potential actions to take, and more. We will also provide you with ideas about putting on events and attracting more people’s attention to this urgent issue. We have drawn up some fliers with which STAND chapters across the country can flood their campuses. Check out the website, print off some fliers, and start a conversation. Let’s make this issue heard! This post was written by Luke Kubacki, STAND’s Campaigns Coordinator. Luke is a rising junior at Ohio University. If there is one central idea that sums up my college experience so far, it would be this: everything is more complicated than I first thought. I’m sure we all have hundreds of our own examples of this life lesson playing out. Unfortunately, there is a huge temptation to fight this complexity instead of embracing it, ignore it instead of engage with it. The second we decide to ignore this complexity is the second that we allow injustice to infiltrate areas of our life that we have the power to influence. This happens all the time both in our personal day-to-day as local, national, global citizens, and in history as we look at big picture in war, peace, atrocity and prevention. As students, we all have different complexities we must choose to engage with in our particular concentrations. There is one system, however, that we all interact with most days and whose complexity has great potential for excruciatingly incremental, but real, social change. The significance reaches far beyond me or us, however. The power in our spending is a complexity that many of us don’t engage with during our day-to-day spending. More and more, as our options have become aisles long, everything we buy is as much a decision tonot buy something else. Each dollar we spend is an investment in something, and also an investment in everything that went into getting that something to you. When you buy an organic apple instead of a conventionally grown apple, you buy an apple, sure. But you also invest in the ideas behind organic agriculture. This thinking is nothing new. What we need to do is realize that there is no neutral. A dollar spent, no matter how hard we think about it, is a dollar invested in a labyrinth of different ideas. Once we acknowledge that, a responsibility falls on us to make sure that our investment is a wise one. That is where genocide prevention comes in (finally, Luke, gosh). The various conflicts that are currently ongoing and that continually emerge are not isolated in a vacuum; they are fed by the unstoppable exchange of ideas and goods that flow through our conversations and communities. In short, what we do influences, with various degrees of subtlety, conflict areas around the world. When you look at the importance of currency and physical resources in fueling or sustaining conflict, the gravity of even our personal financial decisions is easy to appreciate as we watch them multiplied by many millions across the globe. This responsibility is heightened, however, when we look beyond our personal lives and examine our collective influence associated with the communities we are a part of. Personally, as an American, I look at United States’ foreign policy as one of these influences. The aid we send, where it goes, where we invest resources, why we invest resources etc. are all ways that Americans, as a community, support ideas that have profound influences on conversations happening around the world. Focusing in on students, one of the significant communities within which we as students have an influence is our schools. Here at Ohio University, which I can see from here on my front porch as I type, there has been a significant and prolonged push for ethical investment practices rooted in a Conflict Free Campus Initiative (CFCI) campaign started a number of years ago. A group of students, who would later become a STAND chapter, saw their university community and the money that it invests, as a huge opportunity for responsible promotion of ideas on a scale significantly larger than each individual acting alone. Over the past 5 years, that pressure to eliminate conflict minerals from the university portfolio has spilled over into pressure on the university to invest responsibly in a number of other issues. These investment procedures vary from place to place and are always very intricate and complex. The ways that our money decisions, both personally and collectively, influence the global conversation and even atmospheres of genocide, are subtle and hard to connect. Again the message: it’s more complicated than you think. But we, as an engaged community of students, must be sure to embrace the complexity of these connections instead of shying away from them. There is no neutral. Once we ignore the responsibility of this interconnectedness because of the complexity, we open our influence up to irresponsible and damaging effects that can have significant impacts. Think of the thing you buy most often (coffee for me) and do a little research. Trace the physical resources that are used and the ideas that are promoted when you buy the item. Trace these ideas and products you spend money on and find ways that they link back to conflicts around the world. The STAND chapter here at OU was started by a girl researching the materials in her cellphone for a class and discovering conflict minerals mined in the Congo. There are connections, we just need to find them. And finally, if you have cool stories or thoughts or anything to share, then SHARE. This type of subtle influence is something we always need to be reminded of. E-mail me at lkubacki@standnow.org. This topic fascinates me and I’d love to hear about anything you’ve experienced.